This is my husband’s favorite catalog — and favorite company: U-Line. If you need packing or shipping boxes…or any kind of organizing box or wrapping or a gazillion other things…check this catalog first. The prices are a gazillion times better than retail places like U-Haul (for moving) or Staples (for organizing.) They claim over 950 box sizes always in stock. Of course, you must buy in bulk but generally not 100’s – more like 10 or 25. And U-Line has great service, will deliver right to your door. The print catalog is free, and tons of good reading. Of course, the catalog is also online if you need something in a pinch. With all the online commerce going on today and into the future, my husband wants to buy stock in this company. I think he’s on to something. U-Line online – order print catalog there. i gotta say, the digikey catalog is my personal favorite, but uline is a close second…it’s just not nearly as good for starting the bbq when it’s obsolete as the 10lb black and white digikey! 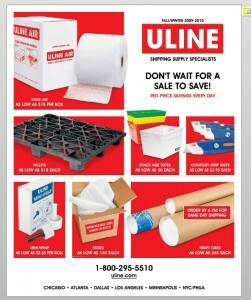 Uline has the best prices ever on bubble mask…bubble wrap that is slightly sticky on one side. A total moving/shipping lifesaver, and it can be saved and reused many times!